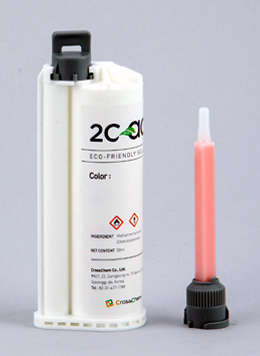 2c-ad (Two C Ad) signifies adhesive produced by CrossChem. CrossChem is a manufacturer of global acrylic solid surface adhesive. Our product is specialized in diverse color and convenient application. The management direction of our company is developing complete color matching of adhesive in a short time with global solid surface product’s. Also we would like to provide consistent quality product to our customers by designing creative color and leading the industry. Especially, our company considers the environment and health of fabricators of solid surface and the final customers. Thus, we emphasize the environment friendliness of all ingredients of our product. In order to maintain the high quality of products, the whole process from polymerization to packaging is managed consistently. High tech computer color matching is adapted to advance the product quality with new color development and continuous improvement in technology.